We Just Turned 9 Million! There is cause to celebrate! That’s right! 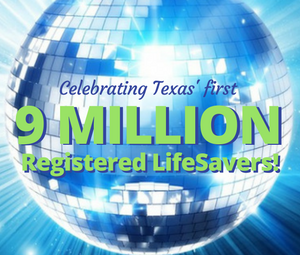 The Donate Life Texas donor registry is celebrating the lifesaving commitment of 9 million Texans who have now joined the donor registry. The donor registry was created by and remains part of Texas state statutes. During the 2015 session, Sen. Judith Zaffirini (D-Dist. 21) and Rep. John Zerwas M.D. (R – Dist. 28) championed legislation that has, among other things, allowed DLT to use mobile technology to register more people more quickly and in more places than ever before. Each and every Texan who applies for or renews a state driver license or ID card is given the opportunity to register with Donate Life Texas as a donor. This single step relies on the support hundreds of DPS employees and is responsible for roughly 97% of all donor registrations. In Texas, 15 Donate Life Texas organizations perform the organ, eye and tissue recovery procedures. These dedicated professionals are also the ones who work closely with donor families to guide them through the process of their loved one’s donation. This year, both TASC and TAPA have adopted Donate Life Texas and donor registration as statewide initiatives for their members. This means that young leaders across the state will be learning about the rising need for transplants and the importance of donor registration. They will also be hosting Unite4Life campaigns on campuses, at events and in hospitals throughout the state. The Unite4 Life portal offers community organization and individuals access to everything needed to host a registration drive, including educational resources, registration drive materials and the ability to create a custom campaign page. 9 million registered donors is a lifesaving start. So far this year, 327 people have received organ transplants thanks to registered donors in Texas and thousands more have been given the gift of sight through cornea and ocular tissue transplants. And, each year in the U.S., more than a million people receive donor tissue for a wide variety of medical needs ranging from orthopedic surgery to burn recovery. Having 9 million registered donors in Texas helps make these medical miracles possible, but we still have more to do. Simply put: The number of people needing transplants is growing. The number of potential donors is not. Thanks to medical breakthroughs, more more lives than ever can be saved by treatments that rely on donor organs and tissues. Also, the growing prevalence of diabetes and heart disease have increased the number of people on the organ transplant waiting list since these conditions can often only be cured by a transplant. However, also due to medical advances, fewer people are passing away from stroke and traumatic brain injury, the two most common causes of death which allow organ donation to occur. In fact, fewer than 2% of all deaths occur in ways that allow for organ donation. Of the 178,000+ people who passed away in Texas in 2013, only about 3,500 were potentially eligible for organ donation. This number then drops even further if consent is denied or if the organs are not clinically viable for transplantation. Registering with Donate Life Texas records a person’s legally-binding decision to be a donor so it can be known by the right people at the right time to save lives. In the simplest terms, donor registration helps ensure that every transplantable organ can become a gift of life. Most of all, THANK YOU for registering to Donate Life! Each of us are one in 9 million, but to the person waiting for a transplant, you could be their one Donor Hero.